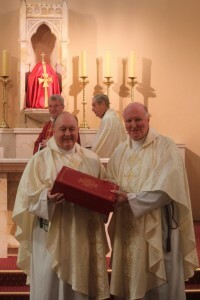 The new English translation of the Roman Missal was officially launched today by the President of the Australian Catholic Bishops Conference Archbishop Philip Wilson during the Bishops’ Plenary meeting in Sydney. Chairman of the Bishops’ Commission for Liturgy, Archbishop Mark Coleridge, spoke of the project of re-translation which has spanned over ten years and affirmed that the new Roman Missal, while not perfect, is a significant improvement on the texts that have been used since 1973. “We have a richer and stronger text for use in the liturgy and a solid base for developments that lie in the future”, he said. Executive Officer of the Liturgy Commission, Fr Peter Williams, was pleased with the product and the process of working together with secretaries from other Bishops’ Conferences together with the Catholic Truth Society who published the Missal. “It has been a happy experience working with the secretaries from England and Wales and Scotland”, he said. Special presentation copies were presented to Archbishop Philip Wilson as President of Conference and Archbishop Denis Hart who was the episcopal editor for the British English version. These special presentation editions were printed in Italy along with the Missals now in being distributed in Australia by St Paul’s Publications. The Roman Missal comes into full use in parishes across Australia this coming Sunday, the First Sunday in Advent.